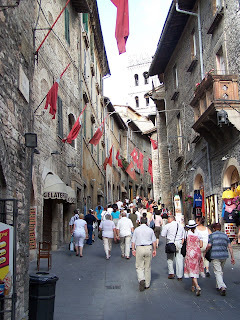 The streets had flags all over - just as I would have imagined a 12th century town would have looked! Looking through a gate to the courtyard in the church of Saint Francis Wandering the streets of Assisi - we found an old bell tower. 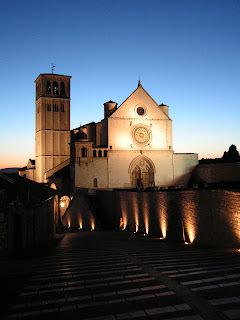 Wandering the streets of Assisi Church of St Francis at dusk Wandering the streets at dusk This morning was a bit of a frustration to all of us. We found out that there had been a bit of a revolt last night at the included dinner that we had opted out of. Evidently, several people began complaining that this trip wasn’t all that they dreamed it would be. And so Franco, our tour guide, had to call in the Globus representative from the area to listen to their complaints. So she went from group to group listening to their frustrations. Well, our family didn’t have any complaints. We were just happy and felt very privileged to be there. We were having the time of our lives! Finally, after nearly a 3 hour delay, Amy asked if we could go. So we left and headed to Assisi. 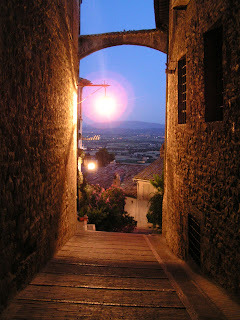 Assisi is a quaint medieval town situated on the top of a hill with the most amazing view. It is perfectly preserved just as it was in the 1300’s. People still live there. There is one street that small cars and motorcycles are allowed to drive on. Otherwise, traffic is forbidden. It was lovely. 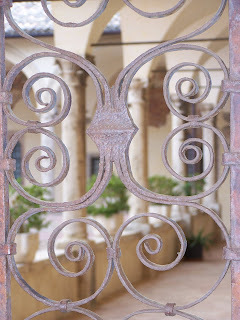 We stayed in an old monastery, and right behind our rather unadorned hotel was a convent. We were told that we could go up to the roof at night, but that we had to be very quiet. If we were noisy, the nuns would come out and yell at us. That painted a funny picture in my mind. 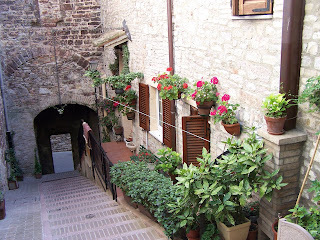 Everywhere you looked in Assisi, you saw nuns and monks. 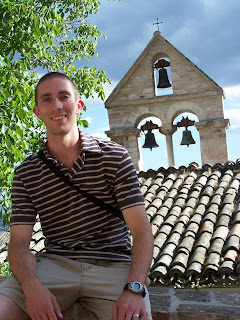 We went to the chapel of Saint Francis of Assisi, and it was filled with nuns and monks. It was quite interesting. I have found that I think these churches are beautiful. The art is breathtaking. The architecture is incredible. But they make me very sad. They are like shrines to these saints, instead of to God. This particular one portrayed Saint Francis as Jesus. He had holes in his hands and feet in paintings, etc. It was disturbing to me. Even more disturbing was when we went down to the basement and saw his very elaborate tomb. People were prostrating themselves before the tomb and weeping and praying. That to me is idolizing a man, and not worshiping God. It was disturbing to me. We did get to see many relics that were thousands of years old and worth millions of dollars I’m sure. I enjoyed seeing it, but walked away with an uneasy feeling in my stomach about this whole worshipping the saints thing. We walked around the city for a good while. It is a beautiful city. It’s all built of stone and built up-hill, so to get anywhere, you have to climb. Sure, it’s paved, and sometimes there are stairs, but I was so out of breath by the end. It was quite strenuous, and I said several times that the people who lived there must be in the best shape! Everywhere we turned, there was a new little skinny road leading to somewhere else interesting. The higher you went, the more rooftops you saw. It was really quite lovely. And there were flowers everywhere. They surrounded windows, doors, and they even popped out of the sidewalks. There weren’t really gardens, but somehow, the flowers grew right out of the stone buildings. They had cocktails for us before dinner on the rooftop, so we went up and joined our tour group. There was the most fabulous view. And the most magnificent peanuts and blood red orange juice. I must have been hungry. After dinner, Jason, Kendra, Stef, Dan, Amy, Chris and I walked up to the main square. Kendra had been sick off and on and her ear was really hurting her. She thought she needed an antibiotic. There was a pharmacy open, so she went in and was trying to explain what she needed. The language break-down was evident, so Chris went in and tried explaining. Some of the medical terminology was the same, so they were able to communicate better. Basically, Chris told him she needed amoxicillin. The pharmacist asked if he was a doctor and he tried to explain that he was a medical student, but that wasn’t understood. Finally, because the pharmacist thought Chris was a doctor, he gave Kendra the prescription. That would never happen in the States! But Kendra was very grateful! In the meantime, Stephanie, Amy and I were standing outside. Suddenly, something dropped, and Amy squealed. I thought it was absolutely hilarious that a bird did its duty right in Amy's hair! It couldn't have had better aim! Amy's squeal just added to the hilarity. Such fun! After walking so Amy could get her coveted Canolli, we walked back to the hotel, enjoying the candles along the way, reminding us that this was indeed a well-preserved medieval town.